I love mornings. Every new day brings new opportunities and is a chance to start fresh and do better. How you start your day, or more specifically how you spend those first few morning hours has a big impact on the rest of your day. Think of it as setting the tone for your entire day. That’s why making over your morning is so important. It’s about much more than those first few hours. I’m sure you’ve experienced this yourself. Let’s use the snooze button as an example. You set an early alarm to make sure you have time for exercise, meditation, or simply some much needed “me time”. You have every intention of getting up and doing whatever you’re setting out to do when you set the alarm in the first place. Some mornings – hopefully, most mornings – you get up when the alarm chimes and go for that walk, do your meditation exercise, or read a book for twenty minutes. Then there are those days when you just can’t make yourself get up. You hit the snooze button multiple times, or turn the alarm off altogether and go back to sleep. Did you notice a difference in how you felt? How much did you got done on the mornings when you got up with your first alarm? Were you able to do all the things you set out to do? How did those days compare to the ones when you hit the snooze button over and over again? If I had to take a guess, I’d say that the mornings when you got up as soon as the alarm went off went a lot smoother. I bet you accomplished what you have planned to do, too. Chances are that sleeping through the snooze button didn’t just affect your morning, but the entire rest of your day. You set the tone for how your day is going to go first thing in the morning. That’s what the old saying about getting up on the wrong side of the bed is about. Let’s make sure we get up on the right side and start our day off in a positive and productive way. What is the one thing you really want to do on a daily basis that would make a big difference, but you just can’t seem to find the time for? In short, what good habits do you want to cultivate that would make a real impact on your life? Don’t just say the first thing that comes to mind, think about this for a moment. It could be in any area of your life from exercise and healthy eating, to self-improvement or getting ahead in business or at your job. It could be working on your relationship with your kids, finding time for creative pursuits, or getting in the habit of reading every morning. I bet at the back of your mind you are thinking of a few areas that you struggle in. I know that I have a ton of areas that could use a bit of help. 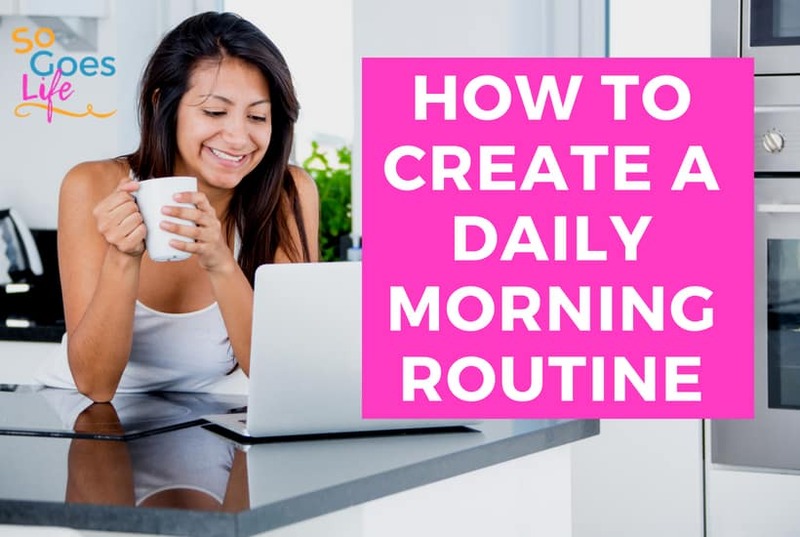 Once you’ve figured out what you want to work on, what you want to improve, and what’s important to you, the next step is to think about how you will incorporate this habit into your morning routine. Sit back and imagine your perfect morning. Your morning isn’t stressed or rushed. It is a morning when you have time for everything on your list. Maybe it means having time for a long shower – no more dry shampoo (I swear by this stuff)! Maybe it’s going for a run before breakfast. Maybe it’s having a few minutes to connect with your spouse over breakfast. Maybe it’s carving out an hour first thing in the morning to work on your side-business. That’s a lot of “maybes” but the key is to start with what’s most important to you and think about how you can fit the little extras into your morning routine. Remember, you’re just dreaming and imagining at this point. We’ll work on figuring out where to find the time to fit it in and how to make it all work out later on. For now, I simply want you to paint a vivid picture of what your new morning could look like. I want you to become very clear on what you want that perfect morning to look like. Imagine it in as much detail as you possibly can. Write down your image of your perfect morning in a journal that can be referred back to later. In short, define your perfect morning. Why is this so important? Because you can’t start to make any meaningful changes until you know what your goals are. You need to know your destination before you can start to pick a route and figure out how you’ll get there. That’s what today’s task is all about. It’s figuring out where you want to get to. Don’t stop until you have it figured out and firmly pictured in your mind. Mornings are busy and they can be quiet chaotic. If you have a young family and plenty of people to get ready and out the door, you know this first hand. Do you want that to be rushed, frantic, and feeling like you’re constantly running and trying to catch up? Or do you want it to be calm, collected, productive, and with a feeling that you’re in control? It’s up to you and it’s all about embracing two simple concepts. It’s tempting to hit the snooze button and catch a few more minutes of sleep, isn’t it? It’s even harder to set the alarm early enough that you have plenty of time for everything you want and need to get done. If you’re not a morning person, moving up the alarm by 30 minutes to carve out a little extra time can be tough. Trust me though, after the first few mornings it’s not nearly as hard as you think and something you’ll quickly get used to. Getting up early enough and avoiding the snooze button at all costs is the key to an unrushed morning. Here’s the problem with cutting time too short, or worse hitting the snooze button a few times. It gets you behind from the very start. You have to rush to make it out the door in time and any little problem or speed bump along the way turns into a huge problem. Not being able to find the car keys is suddenly a major crisis because it could cause you to be late for work and the kids to be tardy at school. It isn’t fair, but as the mom, you completely set the tone of the day for your entire family. If you aren’t up and functional then the rest of the family suffers. Getting up early, on the other hand, puts you ahead of the game. You can take care of everything that needs doing in a calm manner and still have time for the important things you want to work on. In short, getting up early sets you up for an amazing, productive day. Before we wrap this up, spend a little time thinking about your current morning routine and where you’re spending time. Look for things you can change and tweak to find more time for the things you really want to do. For example, if you want an extra 20 minutes in the morning to meditate, look at what you could take care ahead of time, eliminate, or delegate to make that time. If you spend a lot of time getting breakfast for everyone, get in the habit of setting the breakfast table the night before. Teach the kids to make their own breakfast and take the dirty dishes to the sink, rinse them, and put them in the dishwasher. Book bags, homework, purses, briefcases, and car keys have a designated spot. Small changes like this to your morning routine can make a big difference. I challenge you to come up with a few small tweaks that will save you at least 30 minutes in the morning. I want you to think about what you should and what you shouldn’t be doing in the first few hours of the day. This is an important idea to ponder. So often we get stuck in a rut or a routine and do things because that’s what we’ve always done. We do it without really thinking about whether or not it’s the best use of our time. Making over your morning isn’t about figuring out how to cram more tasks into fewer hours. When you read books and articles on productivity and time management, that’s often the main message and gist of it. While it can help in the short term, it isn’t a good long-term strategy for meaningful change. Very soon you’ll hit the limit of how much faster and how much more efficient you can get. Shift your thinking and don’t try to add to what you do in the morning. If you want 15 minutes for bible study, meditation, or exercise, don’t just think about getting up 15 minutes earlier, or shaving 15 minutes off your morning routine by showering faster, getting dressed in record time, and rushing through breakfast. In other words, don’t add to your already lengthy list of things that need to get done. You’ll only feel more rushed and stressed if you do. Instead, what you should be thinking about is the best use of your time in the morning. Compare your perfect morning with your current morning routine. What aren’t you doing on your ideal morning? If you can start by cutting things out, finding time to do what’s important to you becomes much easier. There are two great ways to find things you can stop doing. The first is to look for busy work. This is something you do out of habit that doesn’t necessarily need doing every day. Maybe it’s checking your email first thing in the morning or playing around on Facebook for half an hour while eating breakfast – This is totally me! If that’s how you choose to spend your time, that’s perfectly fine, but if you’re doing it out of habit it may be time to rethink it. The second way to quickly earn back time is to see if you’re doing things for others that they can do themselves. Kids are the perfect example. We start out fixing their breakfast, making their lunch, cleaning up after them, picking out their clothes, and making sure their backpack is packed and ready to do. When they are very small, we have to do these things, but all too often we continue to do them long after they’re capable of doing things on their own. The same goes for things we do for our spouse. Maybe there was a time when you had less to do in the morning and it made sense to take on the majority of morning chores. Did things change and if so, is it time to lighten your load and get help from your partner? A few small changes may be all it takes to make the time in your busy morning for what’s important to you. The best place to start is with the new set of tasks that are most important to you. Figure out a preliminary time during which you want to get them accomplished. If your goal is to go for a run in the morning, you may decide to do that first thing before getting a shower and having breakfast. If your goal is to meditate each morning, you may decide it would work best after you’ve had breakfast. If your goal is to find some time for reading or your favorite hobby in the morning, you could carve out some time before everyone else gets up and while you enjoy that first coffee. The same goes for wanting time in the morning to work on your business or learn something new. Then work the rest of your morning chores around these new plans. It may take some shuffling around and mixing up of your current routine, but with a little creative thinking and a bit of flexibility, I’m sure you can come up with a working plan. Making over your morning and turning it into a new routine isn’t something that comes naturally to most of us. It takes a little while to get into the groove of things. I recommend that you write your new morning game plan down. It’s easy to forget what you’re planning to do. Writing it down will not only give you a reference to refer back to, but also solidify your new plan in your mind. Put the note or notebook where you jotted down your new plan on your night table or somewhere else where you’ll see it first thing in the morning. It will serve as a reminder of what you’re intending to do differently in the mornings. Even though you’ve written your plan down, it’s important to realize it’s not written in stone. The well-laid out plans don’t always work when put into action. Adjust it and make changes as needed until you come up with a new morning game plan that works well for you and the rest of your family. Use this Morning Routine Checklist to help plan your morning. With your new morning game plan figured out, it’s time to not only put it into action but make it your new morning routine. 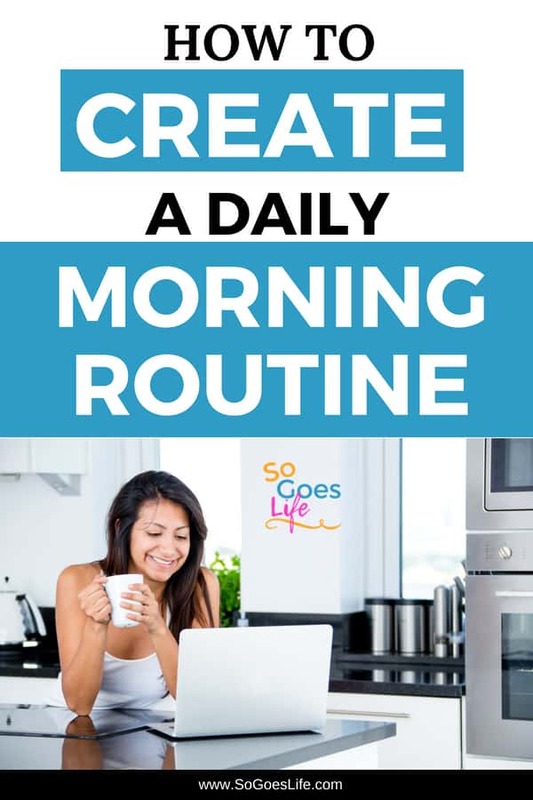 Because you want to make sure your new plan happens every morning without fail and turning into a routine is the best way to make sure that happens. Before something becomes a habit or a routine, it takes a lot of willpower for things happen. That’s energy that you will need for other things throughout your morning and busy rest of the day. Yes, it will take some willpower, mental energy, and drive at first to create the new morning habits, but once they are set, it will become automatic like brushing your teeth before bed. Once you come up with a good working morning routine, stick to it for a few weeks. That’s the best way to turn it into a strong habit. Before long, it will feel like the new normal and you no longer have to remind yourself to do each thing along the way. It will have become a habit and a routine you’ll follow automatically. It will take a lot less effort and mental pep-talk to get things done… even if your new routine includes a 30-minute run, or getting up at the crack of down to work on your most important business task for an hour. Watch out for moments when you slip back into your old habits and routines. The key is to catch it early and get back on track as quickly as possible. For example, let’s say you’ve been doing well with waking up 30 minutes earlier and going for a run before you start your day. Then one day you oversleep and can’t make it out there. Or the weather turns too bad, you get sick or hurt, or something else pops up that keeps you from going on that run. What’s important is what you decide to do the next morning. Your most important job whenever life gets in the way of your new morning routine is to get back on track as quickly as possible. Do what you can as soon as you notice the disruption. If the weather is bad, do a quick workout at home, or head to the gym to run on the treadmill. If you overslept, try to squeeze in a few minutes of meditation or doing something to grow your business before you get back to the rest of your day. Most importantly get back on track with your regular morning routine as soon as possible. Get back into your new habits the next morning if at all possible. Actively remind yourself to get back on track for a few days until it routine is firmly back in place. You’ll be glad you did when you start to see the results you’ve been hoping for. Creating routines and habits for your mornings are a great thing. They allow you to do what you need to do to move ahead without having to spend a lot of energy and time thinking about it. It’s can also be a dangerous thing when your focusing on the wrong things and are in the habit of doing things that don’t help you reach your goals. When we get into a routine, it’s hard to stop and ask ourselves if it’s working as well as it could be. Even more importantly, with a routine and a set of habits firmly established, it’s easy to keep going even when the circumstances change. That’s why it’s important to take some time every now and again to review our routine and habits, including the new morning routine. Set aside a little time every few weeks, or even months to review your routine. Put it on the calendar and make sure you do it. It won’t take long and it will be a very valuable exercise in the long run. Our lives and circumstances change. Our routines should change with it. Just because something has served us well over the past few weeks and months, doesn’t mean it will continue to do so. Keep tweaking and improving your morning routine and don’t be afraid to mix up your goals for it. Maybe you started out by making exercise a priority first thing in the day. As time goes by and you become more fit and make time for it later in the day, your focus may shift to meditation, or learning a new language. Keep evolving, keep changing, and keep using those precious first few hours of each day to establish some positive change in yourself and those around you.